It was kind of a delightful surprise, really. We already knew we would be recording a few videos with our friend and Lost State Records label DIYer Trey Hanawalt (a SLO-Portland transplant), but we had no idea what that would really entail. We knew it would include a cool, inventive traveling drum kit called a Beatbox, but that's about it! As we drove from Portland to the rural area called Canby to do the recordings in Trey's friend's basement, we thought we might be lost. Everywhere: hillsides, farmhouses, horses, and gorgeous greenery...for some reason I thought we'd be more near the city? Trusting Trey, I pretty much just said "Yes!" when he asked us to play, and figured everything would fall into place. Plus, our first show was planned for the Twilight Cafe that night, and we had plenty of time to get our wiggles out. Well, the experience went pretty swell indeed, thanks to Trey's hospitality and a bit of liquid inspiration courtesy of Montucky Cold Snacks (more on that in a sec). We arrived at an expansive farmhouse with weathered white paint. 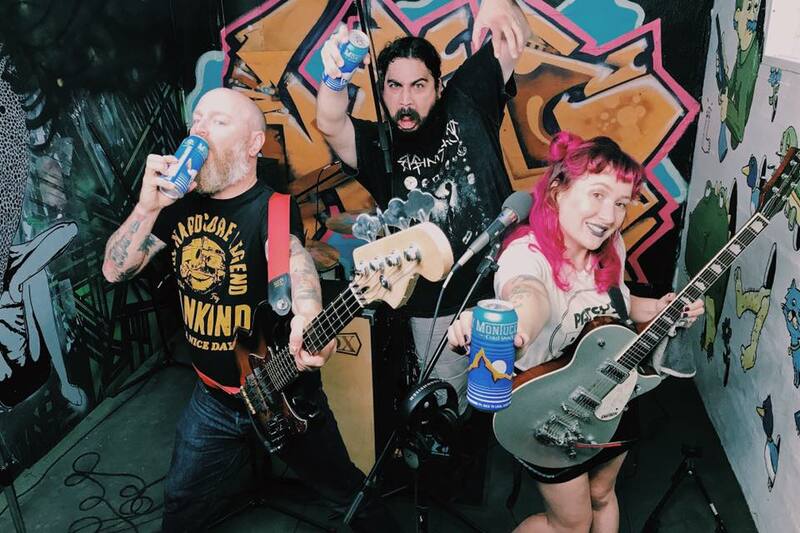 As a CA girl, I haven't spent much time in murky old basements, but I always love the feeling of being secure and cozy, and there is something I find so punk rock about playing in a teeny room underground! Silly, I know...but I am a sucker for basement ambiance. Descending the creaky wooden steps, the air cooled considerably and, as if by magic, waves of art revealed itself. Brightly colored murals - like some sort of cartoon acid trip - flanked the walls. A couch, recording setup, and jam room appeared! OK, what? Way cool! This is where we got our first IRL introduction to Beatbox Drums and Beatbox Live Sessions' official sponsor, Montucky Cold Snacks. 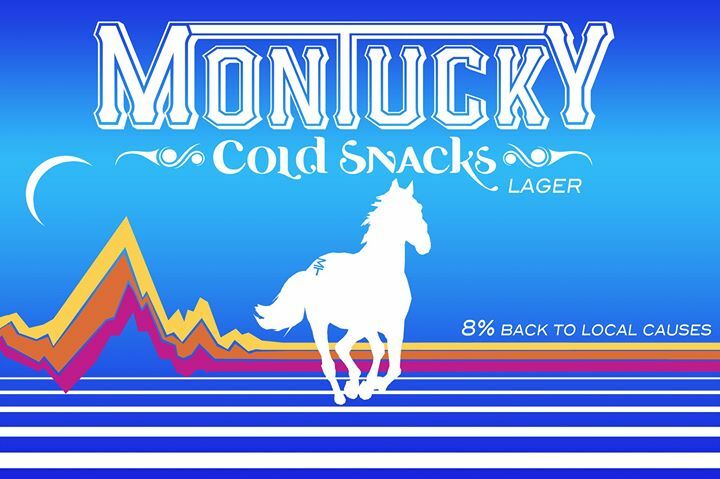 What is a Montucky Cold Snack, you ask? GET THIS. It is a drink best served (pretty) cold, yet is it is not entirely a "snack" in the traditional terms. It is a refreshing beer with a logo that could double as the cover of some sort of 1970s shampoo bottle or inspirational poster (I 100% APPROVE!!!!). See below for proof. Thirsty much? Why can't this be our logo? Why can't this be painted on the side of our van? If you are traveling through Portland area, I highly suggest you hit up Trey and get in on this cold-snack-drum-attack experience! He took great care to produce the videos well and we sounded way more profesh than normal thanks to his expertise. Now I am no drummer, and I famously say "I cannot speak drummer." That is, BTW, because I am too lazy or dumb to try, not that I have anything against those skin-beating barbarians (my mom, on the other hand, always told me never to date them). Seriously though...whenever I try to communicate an idea for a cool drum beat, I just start making crazy rat-a-tat-tat sounds like some sort of glitchy Furby. Our drummer Gabriel Olivarria, on the other hand, is a drummer's drummer. He's better than that. HE IS THE HOLY GRAIL, A METAL DRUMMER WHO DIGS POP! Just look for the combo Katy-Perry pinup/Pentagram emblazoned on his snare! (copyright Crushers, 2017). So. What would a totes metal drummer think of a teeny tiny kit produced for max mobility? Side note for real musicians and drummers: The Beatbox is 31" x 19" x 19" in size. Is a fully functional 4 piece drum set with a 10" x 5.5 "snare drum, an 8" x 4" rack tom, and a 10"x 6" floor tom, and patent pending 16" bass drum. As an added bonus, it doubles as a travel-ready case which houses the rest of the kit for easy storage and transport. Well, you can see for yourself! Dare I say it sounded epic? Deep, rich, with a whole lotta good rat-a-tat-tat, I tell ya what! Really though, it was absolutely impressive to hear just how BEEFY this cute little kit sounded! But I won't try to convince you. Watch the vids and comment if you like! PS: Catch Dr. Cain's sweet jump on the first video, Jewel Case! A huge, handsome Montucky high-five to Trey, Sir Drew Clegg, and Beatbox Drums LLC for having us in the basement, letting us try on his horse mask, and feeding me copious amounts of Montucky Cold Snacks, because...well... one cold snack just isn't a proper meal. And remember. If you aren't fighting on Montucky, you aren't fighting fair.